The Public Theater’s production of “Julius Caesar” in New York uses the words written by playwright William Shakespeare 400 years ago. The difference is the actor playing Julius Caesar looks a lot like President Donald Trump. And, as anyone familiar with Shakespeare’s play knows, Caesar is killed in Act 3 by senators who fear he had become too power hungry. Laura Sheaffer has attended Public Theater’s Free Shakespeare plays in New York City’s Central Park for years. But she objected to seeing a character looking like Trump covered with blood in the assassination scene. As he dies, the actor delivers one of Shakespeare’s most famous lines, “Et Tu, Brute” -- meant to show Caesar’s surprise that his good friend Brutus joined his killing. Her comments on a radio program brought more criticism to the play. Two Public Theater sponsors, Delta Airlines and Bank of America, responded by cutting funds to support the Public Theater. “No matter what your political stance may be, the graphic staging of ‘Julius Caesar’ at this summer’s Free Shakespeare in the Park does not reflect Delta Air Lines’ values,” Delta says in a statement. The Public Theater, which began performing plays nearly 60 years ago, defends the production. It notes the play has led to “heated discussions.” But it says that is “exactly the goal” of public theater. 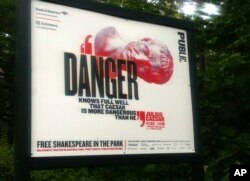 "Danger knows full well that Caesar is more dangerous than he," reads a sign promoting Public Theater's production of "Julius Caesar." Charlotte Canning is a drama professor at the University of Texas at Austin. Canning says the criticism would be understandable if the play suggests violence is acceptable. Act 5 ends with Brutus killing himself with his own sword. Canning also notes that a recent production of “Julius Caesar” in Minnesota included a Caesar character that looked like former President Barack Obama. But the play did not draw the same criticism as the New York production. Thompson wonders if the same message about the corrupting influences of power could be made without making Julius Caesar look like Donald Trump. In the play, Caesar’s wife speaks with a Slavic accent, just like Trump’s wife, Melania. On the other hand, Thompson says Shakespeare’s plays are sometimes difficult for modern theater audiences to understand. And making Caesar look like Trump makes the connections to political power more apparent. Laurence Maslon is the deputy director of New York University’s graduate acting program. He says no one should be surprised that a play by New York’s Public Theater might be controversial. Maslon says that one of Public Theater’s first shows, the rock musical “Hair” in 1967, drew heavy criticism. At issue were scenes with performers with no clothing and a scene in which young people burned draft cards to protest the Vietnam War. “The Public Theater is not the Little Red Riding Hood Children’s Theater,” Maslon says. In other words, the theater produces plays on serious issues for adults and not children. According to New York Times Theater critic Jesse Green, only three words were changed from Shakespeare’s original script in the Public Theater production. That line goes back to Trump’s successful run for president, when he said: "I could stand in the middle of Fifth Avenue and shoot somebody, and I wouldn't lose any voters." Donald Trump Jr., the president’s son, tweeted his objections to the “Julius Caesar” production. “I wonder how much of this ‘art’ is funded by taxpayers? Serious question, when does ‘art’ become political speech & does that change things? The National Endowment for the Arts, which Trump wants to eliminate under his budget proposal, says it did not fund the production.